A real family favourite that’s on the table in 30 minutes. For a grown up version, swap the stock for red wine. 1. Fry the mince and onion in a large, non-stick saucepan for 5 minutes until browned. Add the oregano, mushrooms, chopped tomatoes and tomato purée. 2. Pour the stock into the pan. Cover and simmer for 20 minutes, stirring occasionally. 3. Meanwhile, cook the spaghetti in boiling water for 10 minutes until tender, then drain. 4. Stir the mince into the spaghetti or spoon on top with a little Parmigiano Reggiano, grated. 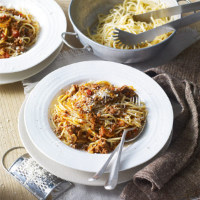 To see a video of this recipe, visit waitrose.com/bolognese. For lasagne, use this Bolognese sauce alternately layered with essential Waitrose Cheese Sauce and essential Waitrose Lasagne sheets, then top with essential Waitrose Mature English Cheddar, grated. Bake for 25-30 minutes until golden.